Recently I attended the Chef’s Pecan Culinary Summit in Atlanta along with other chefs from around the country. Pecans were discovered in central and eastern North America in the 1600’s and have flourished ever since. They have been an important commodity for trade. We learned why pecans are a versatile nut that is not only delicious but also nutritious. Pecans are heart healthy and are packed with 19 vitamins and minerals along with fiber, protein and are sodium-free. I learned how versatile the creamy, toasty pecan could be as we cooked dishes that added the chopped pecans to meatballs, pizza crust, and filling for tacos. We also stuffed them in pitted dates, wrapped in bacon and roasted til crisp. All of these unusual applications were happily surprising and plenty tasty. 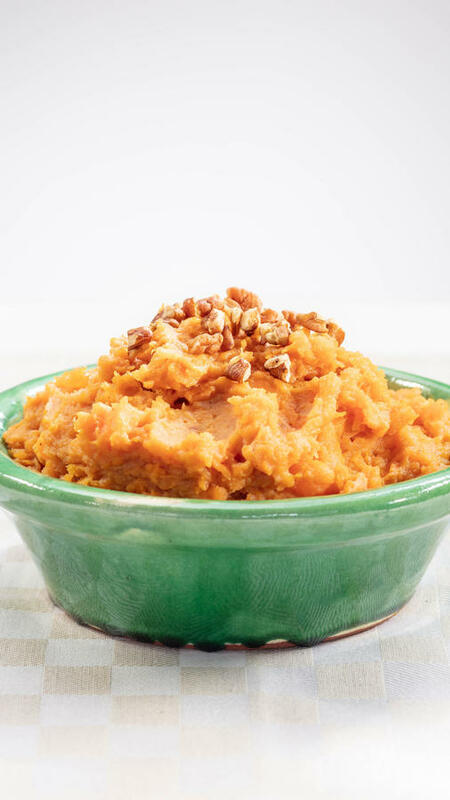 I selected this sweet potato dish to cook for our lunch and the result was so good that I will be making it for my Thanksgiving side dish this year. It’s also a conversation starter when you can explain it includes pecan milk. No need to buy whole pecans that are costlier than chopped since you want chopped pecans for the topping. Also you could substitute part or all of the peach preserves with frozen and defrosted coarsely chopped peaches for a lighter, less sweet version. I like the added spicy hit of cayenne pepper but be sparing with it. Toast the pecans by putting them in a nonstick skillet over medium-heat heat and toasting them by shaking the pan to evenly toast them. They should be fragrant and lightly browned. Reserve. Put the sweet potatoes on the baking sheet with a little space between each one. Roast until the skin collapses slightly and you can slide a knife through the thickest part of the flesh with no resistance, 45 minutes to 1¼ hours, depending on their size. When cool remove the sweet potato pulp and transfer into a medium bowl. Mash in 3 tablespoons butter and the peach preserves until melted and well blended. Drizzle in the pecan milk to desired consistency. The pecan milk will absorb into the potatoes so add enough for a mashed potato consistency. Season with salt, pepper and cayenne, if using. Taste for seasoning. Transfer to a serving bowl. Sprinkle the toasted pecans over the potatoes and serve immediately. This super creamy pecan milk is so easy to make and has lots of uses like adding it to your coffee or using it as a non-dairy milk replacement in any recipe. Add the maple syrup, the vanilla and a pinch of salt. Blend again to combine. Taste, add additional maple syrup if you’d like sweeter milk. No need to strain. When the book Foster’s Market Favorites landed on my desk I was in heaven. Exquisite photography coupled with time-tested comfort dishes are highlighted from her amazing market in Chapel Hill, North Carolina. The introduction written by her husband tells her story— from her roots in Tennessee to finally settling in North Carolina where she and her market have become a culinary institution. This book is a collection of Sara Foster’s recipes from areas of her past—Chicken Salad from Soho Charcuterie, NYC, Says Bread Pudding from her early Market days and a plethora of Southern dishes like Pecan Sweet Potato Sticky Buns and Foster’s Pimento Cheese. I couldn’t get enough of the photos which truly made me hungry when I had just finished lunch! Kudos to photographer Peter Frank Edwards. I settled on testing this recipe after looking at the picture. One word for you—YUM! Easy to put together, this recipe has made it into my Seriously Simple fallback recipe file. I did a bit of tweaking the recipe by slicing the banana that is caramelized rather than keeping it halved. I also used rum instead of bourbon to switch it up. It was hard to let the bread cool because I wanted to dive into it as it sat on a rack resting. I served it for dessert with vanilla ice cream to raves at a casual dinner party and the next day as a coffee cake. Either way, this clever take on Bananas Foster from New Orleans will leave your guests asking for more. 1.Preheat the oven to 350°F. Grease and lightly flour a 9 x 5 x 3-inch loaf pan. 2.Spread the brown sugar evenly on the bottom of a cast -iron skillet over medium heat. Peel and slice 1 of the bananas into ½-inch slices and place on the sugar. Sprinkle the bourbon (or rum) over the top and cook, shaking the pan occasionally until the sugar melts and the banana begins to caramelize, about 3 minutes. Turn the slices over and continue cooking and caramelizing, about 2 to 3 more minutes, or until all slices are nicely caramelized. Remove from the heat and set aside until ready to use. 3.Combine the flour, baking powder, cinnamon, nutmeg, cardamom and salt in a large bowl and stir to mix. 4.In a separate bowl, with an electric mixer beat together the butter and sugar until soft and creamy, stopping to scrape down the sides of the bowl several times. Slowly add the eggs, one at a time, mixing well after each addition. Slice and add the remaining 4 bananas, pecans and vanilla, mixing to break up the bananas and combine. 5.By hand, stir the flour mixture into the banana mixture just until the dry ingredients are incorporated, being careful not to overmix. Pour the batter into the prepared pan and place on a rimmed baking sheet (this makes it easier to handle in and out of the oven). 6.Arrangethe caramelized banana slices evenly on top of the loaf and drizzle with any remaining caramel. Bake 1 hour to 1 hour and 10 minutes, until the bread rises and a wooden skewer comes out clean when inserted in the center. 7.Remove from the oven and let sit to cool, about 15 minutes. Run a knife around the inside edge of the pan, turn the loaf out onto a cooling rack and continue to cool more before slicing and serving, about 10 minutes. I’m not exactly sure why we begin each Passover meal with gefilte fish followed by chicken soup with matzo balls but I have been to enough Sedars to know that this is the unofficial beginning to a long and hearty repast. I love chicken soup year-round and especially when I am feeling the least bit low or sniffly. I am such a chicken soup lover that I always have a quart of this magical potion ready for any emergency stocked in my freezer. Every person who makes it has their own special touch, whether it’s the herbs, vegetables or how they make their matzo balls. Skinless bone-in chicken breasts add more chicken flavor. (The bones help to enrich and slightly thicken the soup). The sweet carrot and parsnip flavor are accented by the onion-flavored chopped leeks. For a slight twist, I add tiny cherry or grape tomatoes 0along with chopped fresh mint. This chicken soup cooks slowly on the stove until the chicken is cooked through and the vegetables are just tender. The chicken is cut up and returned to the soup awaiting its final pairing with the herbed matzo ball. If you prefer a lighter soup, strain out all the vegetables and chicken and just serve the broth with the matzo balls. (Use the reserved chicken to make chicken salad. Matzo balls can really get a conversation started. There are those who love floaters and others who love sinkers. I think it has to do with ones early taste memories. I am a light matzo ball appreciator so you will find that these matzo balls are fluffy and floatable. What are my secrets? I use seltzer water to lighten them and I use schmaltz (rendered chicken fat) to enhance the flavor. Chopped fresh parsley and chives add both flavor and color to the pale beige dumpling. You can make up the matzo balls in the morning and keep them at room temperature in a little water until warming them in the chicken soup. Schmaltz can be found in the frozen meat section of many supermarkets. You will also find it at kosher meat markets. Make sure to melt it before using. Use Kosher for Passover oil if you can’t find schmaltz. Place the chicken breast, stock and water in a large pot. Bring to a boil on medium-high heat. Skim the soup. Add the onions, carrots, celery, parsnip, mint and tomatoes. Reduce the heat to low and simmer for about 1/2 hour or until the chicken is cooked and the vegetables are just tender. Skim periodically. Season to taste with salt and pepper. Remove the chicken breasts from the soup and cool slightly. With your hands remove the meat from the bones, making sure to discard any bone or cartilage; tear the chicken into bite-sized pieces and return to the soup. Cover the soup and refrigerate. To make the matzo balls, blend schmaltz or oil and eggs together with a whisk. Add the matzo meal, chopped herbs and salt to the egg mixture and stir together mixing well. Add the seltzer water and blend well. Cover the bowl and place in the refrigerator for half an hour for the mixture to thicken enough to make the matzo balls. Bring enough water in a large wide pot to come up 3/4 of the way to a boil on medium-high heat. Make the balls by rolling them very lightly into 1 1/2-inch balls. (The more you roll them, the tougher and heavier they will become.) Reduce the flame and drop the balls into the barely simmering water. Cover the pot and cook about 25 to 30 minutes or until cooked through. When ready to serve, remove the soup from the refrigerator and carefully remove any fat layer from the soup. Reheat the soup on medium heat for 15-20 minutes. Taste for seasoning. Add the matzo balls at the last minute just until heated through, about 3 to 5 minutes. Serve in large bowls and garnish with parsley. Advance Preparation: The soup may be made completely ahead up to 3 days ahead, covered and refrigerated. The matzo balls can be made up to 4 hours ahead, covered and left at room temperature. 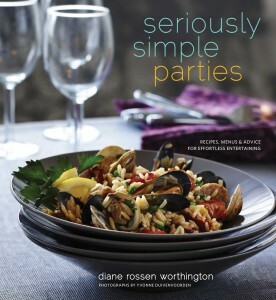 From the author of Seriously Simple (more than 70,000 sold) comes another collection of enticing recipes and useful tips that will help make throwing a party just as much fun as attending one. Using straightforward ingredients, minimized prep time, and streamlined cooking techniques, hosts can serve festive meals with ease. Sample menus—organized seasonally for a variety of groups and occasions—and mix-and-match recipes for every course allow cooks of every skill level to make merry year-round. With great advice on everything from stocking a party pantry to setting an elegant table, plus vivid photos that will entice party planners into the kitchen, this book gives everyone a reason to celebrate. “The PARTIES book is absolutely one of her best. I’ve made nearly every one of the recipes, and as always, the ingredients are “seriously simple,” fresh and totally enticing, but more importantly for busy people, her instructions are clear, concise, and easy to follow.” –C.W. “This book had so many great but easy recipes. Guest went crazy over food prepared for the brunch and wanted the recipes. This is a great book to give you easy but fancy and delicious meals. Highly recommend this book for those that like to entertain.”–J.N. Diane Worthington is not only a fan of California cooking, but of international cooking as well. Currently, she is in Turkey, taking pictures of the amazing food, and experiences, she has found there.